A registered club skater that would like to compete (who is not classified as a Provincial Series skater) will be considered a Regional Series skater. There are four different regions - West, Central, East, and Flex. Niagara Club is in the West region and therefore will compete against skaters from the Hamilton Milton London Oakville Cambridge Kitchener-Waterloo Golden Horseshoe and Bruce County Clubs. Medals will be given to the top three skaters in each division. Skaters will be invited on the basis of their position on the OSSA Short Track Ranking List. Medals are awarded to the top 3 skaters in each division. 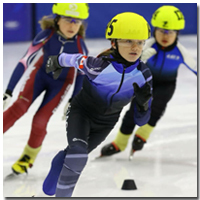 Both regional and provincial skaters that meet specific requirements have the opportunity to skate in the Short Track Championships. The top Provincial skaters may also have the opportunity to skate in the Canada East short Track Championships. More detailed information can be found in the Technical Bulletin found on the OSSA website. Check out our calendar to find out where and when speed skating competitions are held!